Do you want to give your old furniture a second life? Well we at Fox Cleaners can help you with this easily!We are specialists in rehabilitating worn or old upholstery which is why we’re the best upholstery cleaning in London. We have the state of the art professional cleaning machines and techniques that win us the accolades and reviews from our satisfied customers. You can read these reviews at the bottom of this page. Why are we different and how can we help to refresh your upholstery? 1. Value – We always give 100% of ourselves and more. Excellence is where we start. 2. Technology – We update our equipment and techniques every 3 months. 3. Affordability – We are cheaper than 80% of the upholstery cleaning services in London. 4. Certified – We are a certified company recognized as honest and responsible amongst our colleagues in the industry. 5. Protection – After we’re done cleaning your upholstery it will be bacteria free. This leads to a healthier home or office environment. 6. Fast – We work fast because we appreciate how important your time is but we don’t short you on quality. 7. 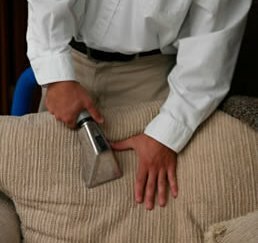 Money Back – If you are not completely satisfied from our upholstery cleaning in London services you will receive our famous full refund money back guarantee the next working day. 8. We are serious – We want to establish a long term relations hip with our customers and that is why we take our job seriously no matter the size of the job. 9. Big Portfolio – We have been in the cleaning business since 1998. During those years we’ve established stellar relationships with our clients. It’s something we’re very proud of and famous for. 10. We Listen – We listen to our clients. Your input is of great value and we encourage it no matter how big the job is. HIGHLY RECOMMEND!FIVE STARS!!! !This cleaning company is second to none .I have a small man and van business based in Enfiled,London.Many times when i move my customers to their new home they have an old furniture that want to get rid off.I sell the most of the stuff to a local shop in Enfield.Last year a had an idea that can firstable clean these chairs and sofas,so the guy from the shop will pay me more money.That was a very bright idea!On average i was getting 20 -30 pounds for a old, upholstery sofa and aroud 50 -60 for a leather ones.Now i'm getting twice as much thanks to these guys! I'm a father of 3 children.I'm proud to say that have 2 lovely girls and 1 great ,6 years old son.Last year you bought an upholstery sofa set from Ikea ,but one morning i found a huge red spot in the middle of the three-seater sofa...we spent 1700 pounds for this set...Anyway,i called Fox Cleaners,because we used them once to clean the carpets and stairs inside our house in West London.They sent one cleaner just 2 hours after my call.The person was equipped with large steam cleaner and has cleaned the spot for under 5 minutes...They charged just me 29 pounds.After the cleaning,my upholstery sofa looks like brand new and i saved a lot of money.Thanks Guys.